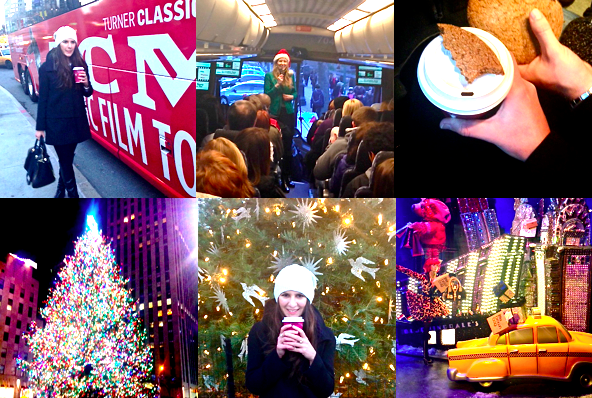 The Resident Tourist: On Location: Holiday Lights & Movie Sights . . . Remember when I went on the On Location TMZ Tour? I had mentioned that I'd love to try the Holiday Lights Tour, and lucky me! I got to go on it last weekend. It was fun and festive and a wonderful way to dive into the holiday season. This tour was quite different from the TMZ Tour. It had four stops where we actually got to hop off the bus - Lincoln Center, Bloomingdales, Barneys, and Macy's. Great for taking photos and getting an up close look at the holiday sights. Our guide, Lou, was an actress in the city and the perfect person to be leading the tour. She was fantastic - always keeping the bus engaged and super knowledgeable on New York film facts. She played corresponding clips with each holiday movie sight we passed and gave us the back story (with some behind-the-scenes secrets) to go along. We hit everything from locations where Elf and Home Alone 2 were filmed to scenes from Serendipity and Family Man. I have to say, apart for a few traffic issues, I really enjoyed this tour! I would recommend it to any Christmas movie buff or visiting tourist - it's the perfect way to see all the holiday buzz around the city, tying it in with the films we've all come to know and love. Get your tickets HERE before the season ends. get there a few minutes early to load up on gingersnap cookies and hot cider for the ride. *Bring a camera, you'll want to take some pics at the stops along the way. *Grab a seat in the front, easier when getting on and off the bus. *Take a weekday tour, Saturday crosstown traffic is no fun. *Finally, sit back, relax, and enjoy. A giant thanks to On Location Tours for letting me ride along! the SATC Tour - which I bet would be worth checking out! Love the photos. So great!